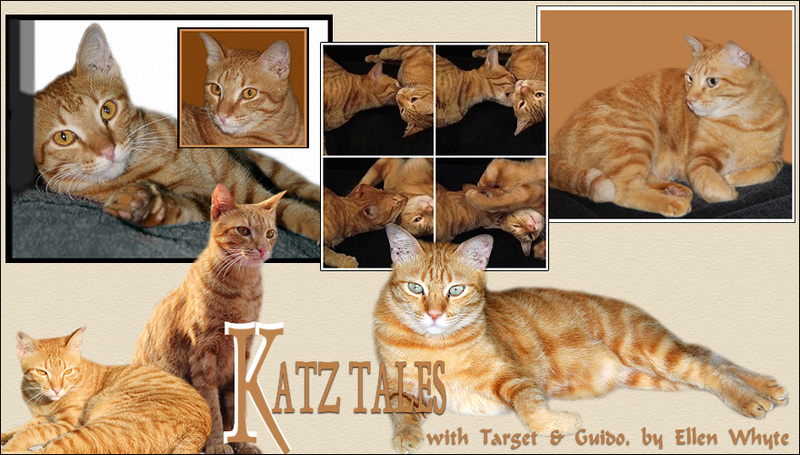 Katz And Other Tales: Living In Malaysia: Do You Worry About Dark Armpits? Living In Malaysia: Do You Worry About Dark Armpits? This month the Unilever company Rexona have launched a new ad campaign that's really weird. In the TV ad some supermodels break down on the motorway. Nobody stops to help until one of them rips off her dress sleeves and shows off her whiter-than-white underarms. Dazzled by this beauty, a car filled with male supermodels shrieks to a stop, the men rescue the girls, and then they all drive off to live happily ever after. My mates say they never even think about a girl's armpits, however, they all know the ad so I guess Rexona know what they're doing. The pic here is the accompanying print ad. What's interesting about this is that in Europe everyone buys fake tan lotion whereas in Malaysia the obsession is for whitening creams. Some people get very excited about this because they see it as Wicked White Western Imperialism. I've read some old tales that show very clearly that white skin was prized in Asia way before the 15th century when Europeans first started taking territory here so I'm not that fussed. I think that it's just that people have different ideas of beauty, and I'm all for that. No one is ever happy with what they are and have! Sheesh! I'm doing good to SHAVE my pits...and some gals BLEACH them? People are weird. I'm happy the way I am and don't care what the world thinks except that I wish I have a bit more $$$$. 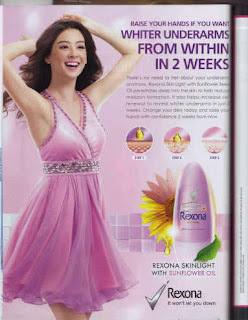 I can't stand that Rexona ad. I find it really dumb. And the obsession on whitening products.....why? I just don't get it. Yeah, I think I'm doing well to shave too. LOL. No bleach, thanks! I do have dark armpits, but they don't worry me at all! To funny! I can honestly say I've never seen a product advertised as an underarm-whitener before. Thank you for your kind message for FLuffy. We went back to the vet today and I have posted an update. He saw lots of bladder lining cells in her wee. We won't have the blood test results till Tuesday. He thinks there may be a tumour :( but I don't know.... I can't find much about bladder lining cells! I hope it is an after effect of all the anti-biotics... fingers and toes crossed. Please keep your paws crossed! Dare I say I wish I didn't have to shave my armpits. If only it was desirable here like having beautiful hair on your head is. Aren't people strange? Armpits aren't the first things that I think about every day :O) I have very fair skin and have to avoid the sun, I don't use fake tanning things because, a)I'm far too lazy and can't be bothered, and b)If I do I look as if I've been fallen into a giant vat of tea and go a strange colour - ho hum. Many congrats on the book btw! the truth is i always get creeped out by ads like that. do not like! Sometimes,I'm here also surprise with some weird advertisement! Please accept our thanks for your good thoughts for Rudy! If I'd been the one coming up w/ that, I do believe I'd market as a shaving lotion with deodorant and bleaching properties. Oh my that is funny. Who cares about dark armpits! Mom says she wishes she were dark brown, then her skin would always be pretty with no spots or such. What is so great about white anyway? It's the same everywhere in the developing world, people treat dark skin as though it were something to be ashamed of. Women powder their faces to the point that they look like corpses. wow! crazy culture! I say celebrate differences--it make the world more interesting! Wishing You A Furry, Purry, Happy New Year! Wishing You A Furry Purry Christmas! Living In Malaysia: Don't Apologise. Fix It! We Have Won An Award --- For Eating Ham! Our romance novel Blackmail Bride is out!